Kavout has developed model portfolios based on vetted and established trading strategies, augmented with machine learning algorithms. The thematic portfolios (get the factsheet) developed help investors gain exposure to macroeconomic trends or ideas that they believe in through managed baskets of related stocks. In this article, we present a recent example of a smart thematic portfolio. Many more thematic portfolios can be developed and managed based on clients’ mandate. To build a smart thematic portfolio, we conduct research to identify investable themes and find related assets using our asset selector. Once we obtain a collection of stocks, we perform portfolio optimization to determine the best strategy. The portfolio is also rebalanced regularly, adaptive to price behaviors and market conditions supported by the models we built. One example of a thematic portfolio is Kavout’s Obesity Portfolio (KSLIM), which optimizes exposure to US & global companies with the potential to benefit from the battle against obesity. Companies in this thematic portfolio may address obesity-related diseases such as diabetes, high blood pressure, cholesterol, heart disease, stroke and sleep apnea, or create products such as weight-loss programs, supplements and plus-sized apparel. For this portfolio, we selected 10 companies related to obesity care, then determined the portfolio weights based on price behaviors and their dependency. Kavout applies data-driven quantamental analytics and machine learning models to select stocks with the highest growth potential in a particular theme, strategically allocate investment across assets, and dynamically rebalance holdings to seek maximum risk-adjusted returns. 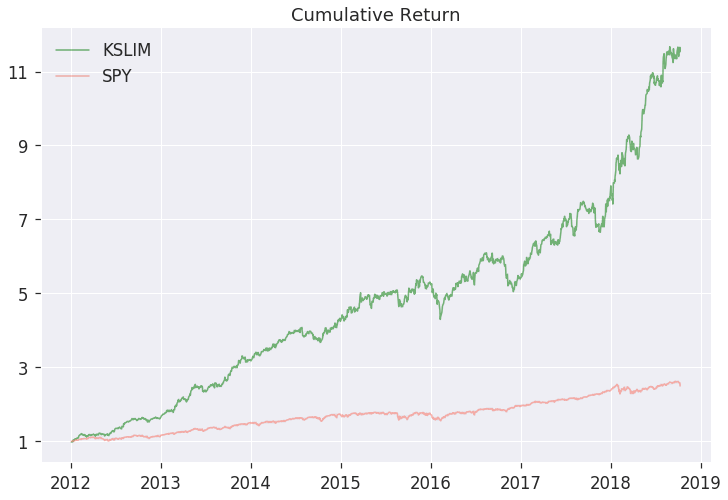 As the graph below illustrates, our Obesity portfolio (KSLIM) has significantly outperformed the S&P 500 ETF (SPY) since 2012. To learn more about Kavout’s other portfolio offerings, please visit our model portfolio page. In addition to smart portfolio construction, we provide rating services for other asset classes, AI stock picks or recommendations, and algorithmic trading. Contact us to learn more about how you can incorporate our AI and Machine Learning technology into your business.